Usually, I just stay logged in to Stack Overflow (via OpenID), and closing and reopening my browser (IE11) works fine to keep me logged in. Once in a blue moon, when I open Stack Overflow, I'm not logged in anymore. Maybe the cookie expired or something? Anyhow, most of the time, I can just login and move on. However, sometimes (like right now), I can't login at all, because the login page is not responding to user input - the "more login options" link, and the "Google", "Facebook", and "Log in" buttons do not do anything when clicked! Closing and reopening IE doesn't resolve the problem. Refreshing the login page does not do anything, either. I usually have to switch browsers (I'm using FireFox to post this) in order to move on. This is not the first time this has happened. And it usually takes awhile (hours, days) for it to clear up so I can login using IE again. Is it just me, or is the StackExchange login page not working on Internet Explorer 11? But I'm getting a different error than JBlitzen was getting. 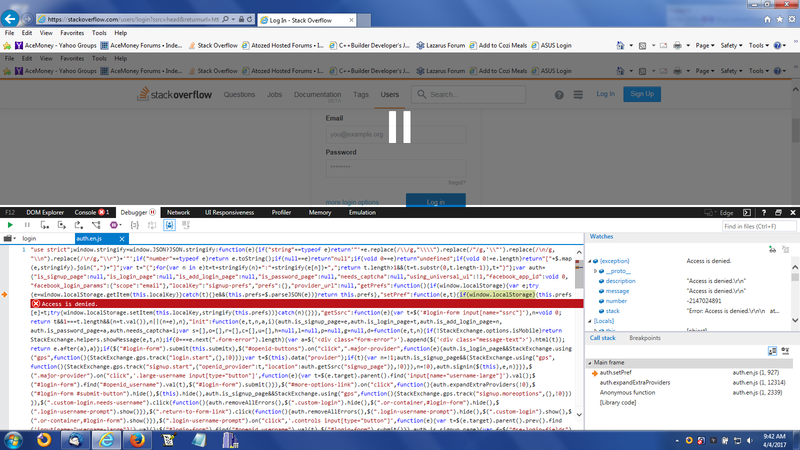 Using IE's Developer Tools, I see the following errors appear when clicking on the "more login options" link. And it has highlighted an if(window.localStorage) statement in auth.en.js. Browse other questions tagged bug login internet-explorer .